Dental implants are titanium posts which are inserted into the bone to replace missing teeth. They serve as a tooth root substitute. The bone around the implant integrates with the implant thread and creates a strong foundation. It is possible to have more than one tooth replaced and this might involve having more than one implant. Implants can also be used to stabilise dentures. Patients need to have healthy gums and enough jawbone to support the implants together with the replacement teeth. While we ask that all our patients maintain good oral hygiene, this is particularly important following an implant. Regular visits to the dentist or hygienist are critical to ensure the longevity and success of the treatment. Implants can involve undergoing surgery twice or more over a period of several months. 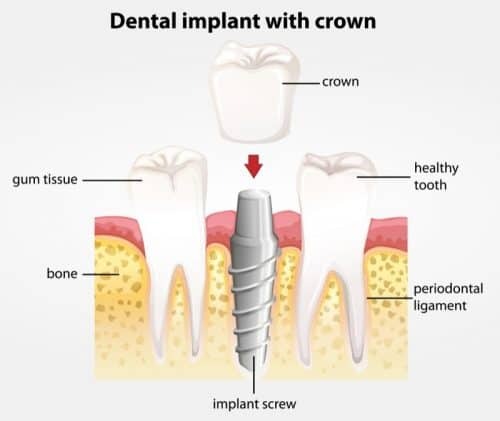 Once the surgery is performed and the bone has integrated successfully, we can now restore your implant with a crown at Canberra Dental Care.